"Ventildeckeldichtung Small Block LA-Engine High Temp Kork"
Unsere Wahl in unserer Werkstatt wenn es darum geht Blechdeckel abzudichten. Am besten mit Hi Temp Silikon in den Ventildeckel einkleben und dann trocken auf die Köpfe montieren. Nach der ersten Warm/Kaltphase mit Gefühl etwas nachziehen. 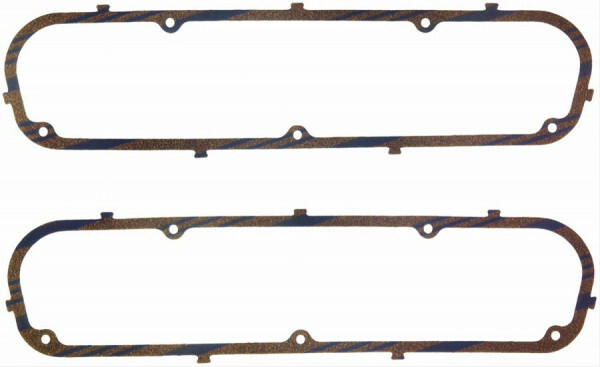 Fel-Pro's popular Blue Stripe premium gaskets are a blend of evenly sized cork particles that are uniformly distributed throughout a special rubber binder. The results are extra-thick gaskets without leak paths, which yield better compressibility and sealing for tough applications. Drehstäbe A-Body 0.89″ x 36″ Stock App.